During the XIV World Congress of Rural Sociology (https://irsa2016.com/), I presented my research “Farmers’ adaptations and strategies within conventional and alternative dairy farming: case studies from the outermost regions of Eastern Finland and Southern Italy”. My presentation was given in the session “Farmers’ decision-making. Farmers’ knowledges and decision-making in rural transitions: what role for social science? Farmers and experts, farmers as experts”. Farmers’ choices are not only shaped by their personality, strategies and competences, but also by non-farm externalities, which include policy and market forces, social and cultural norms, expert knowledge, technologies, and the natural environment. In the light of globalization, and the increase in the sources of uncertainty, it is has become very important to listen to farmers’ voice within the food chain in relation to a variety of issues. Such issues consist for instance of changing policies, markets’ volatility, climate change, exotic livestock disease, the regeneration of both urban and rural landscapes, and of farming traditions. How farmers are proactively engaging with these developments to enhance their adaptive capacity? The understanding of the interaction between the farmer, the farm, and the surrounding context aims at the balancing of short-term productivity efficiency with the long-term sustainability of farming systems. In the latter regard, my participation to the conference session “Terroir in Translation: Exploring the Place of Place in the Global Food System – Legal and Institutional” has made me reflect on the fact that beyond actors’ agency, geographical context is key: farmers’ perceptions should be investigated taking into account the differences between geographical locations. On the one hand, in the Nordic context (particularly Finland and Sweden) sparsity, periphery and cold climate are the specificities that affect in a way or the other farming, and to a broader extent rural economic development. On the other hand, in countries where a strong food culture is present, or it is starting to take ground, the concept of terroir (French origins) is used to delineate and explain those specific geographical and socio-cultural characteristics typical of traditional food and drinks. In the latter case economic development appears to be rooted in a well-defined cultural territory. 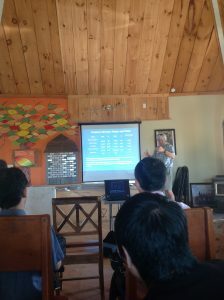 During the conference session it appeared how the concept of terroir has different applications depending on the context. While in some countries its use is relatively new, engineered and constructed by institutions, in others it is dominated by cultural traditions. 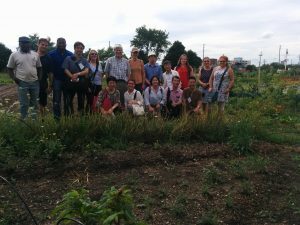 Beyond the participation to the sessions, the XIV World Congress of Rural Sociology has given me the opportunity (by the means of a field trip) to increase my practical knowledge of urban farming, and to get acquainted with the farmland surrounding the Toronto Metropolitan area. The Golden Horseshoe (the most densely populated and industrialized region in Canada located in Ontario) is the home both of the Great Toronto Area (GTA), and of a Green Belt of 1.8 acres of land, of which 1.1 acres is farmland. We are in presence of the best farmland in Canada: 1) the best climate for farming; 2) plenty of fresh water; 3) the best soil for the future of our generations. In turn, the GTA is a vibrant and lively city where over half of its residents were born outside Canada. We are in presence of a huge, differentiated, and multicultural food market: multi-cuisines and multi-niche markets. However, the huge opportunities to link farmers and local consumers are facing and will face two key challenges. Firstly, Ontario imports more food per capita than any other Canadian Province. Secondly, and, most importantly, the best farmland in Canada is threatened by an ever increasing urban sprawl (we are in presence of one of the fastest growing areas in North America) fomented and facilitated by land speculators. This is why urban farming important: people need to understand the value of farming to sustain our future generations. Let’s reconnect farmers and consumers! From the field trip, it has emerged that urban farming has a variety of purposes, which, in a way or the other, are linked to each other: to educate and to train citizens, to be inclusive through participation, and to generate economic development. 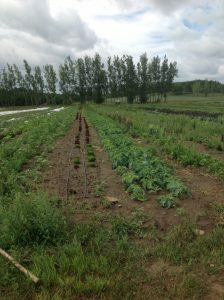 In fact, it appears that urban agriculture is at the vanguard in Ontario: there are many innovative urban growing projects in the Golden Horseshoe (see for instance http://www.foodandfarming.ca/ ). The first stop in the field trip was the Everdale’s Hillsburgh farm. The key goal of this farm is to educate people from all ages and backgrounds on how to farm with tailored training and school programs. 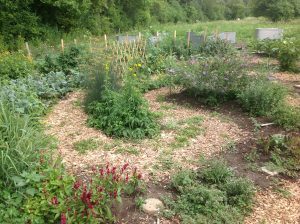 Especially important is to learn how to grow organic vegetables in small plots of land, and sell them in and around the cities through farmers’ markets for instance. Why do we need to educate new people? Farms’ inheritance is not enough to face the challenges of farm aging. Everdale’s Hillsburgh farm has the mission to create NEW generations of farmers, particularly newcomers to farming, and newcomers to Canada. This is the way to create long term sustainability in this world. 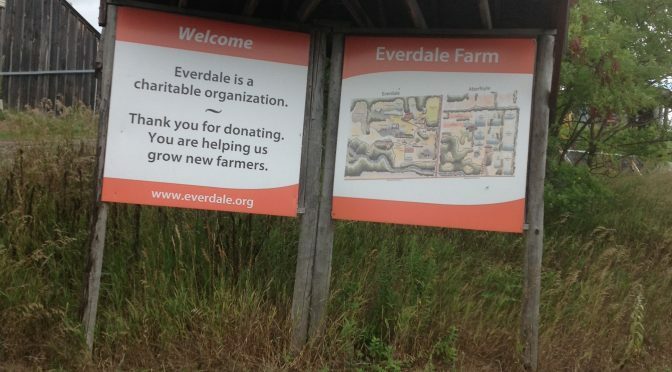 We have to have the courage of reconnecting people with the land (for more information see http://everdale.org/ )! The second stop was at the Kortright Centre for Conservation, which has similar goals of Everdale’s Hillsburgh farm, but it is more targeted to farming demonstration, rather than education and training (for more information see http://www.kortright.org/ ). Our guide lecturing at Everdale’s Hillsburgh farm. Growing organic vegetables at Everdale’s Hillsburgh farm. 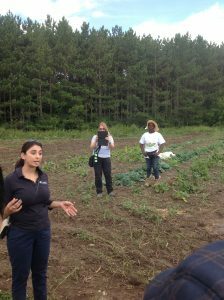 The third stop was at the Black Creek Community Farm, the biggest urban farm in Toronto. Such farm, located in a low income neighbourhood (the poorest neighbourhood in the city in fact, at least according to our guide), has the goal of empower, engage, and educate the local community in the growing and selling of local food both in the same neighbourhood, as well as in the Greater Toronto Area. So this means the involvement of unemployed and/or marginalized people in farming as active actors for building food security, and support a diverse social and natural ecosystem. Despite the numerous challenges (for instance financial viability), this farm is currently a bastion to combat urban poverty in Toronto (for more information see http://www.blackcreekfarm.ca/ ). Picture taken at Black Creek farm. The last farm visited during the field trip was Fresh City Farms, a urban farm which produces organic products, packs them, and sells them though farmers’ markets or by delivery. However, the really interesting thing about this farm is the Member Farmer Program, through which people can apply to have a small plot of land to pursue self-sufficiency and farming business goals (for more information see https://www.freshcityfarms.com/ ). From this field trip I have learnt that, in order to combat poverty, and, above all, to create a new, and sustainable farming, education has to start from the urban centres, by reconnecting consumers and producers, and by training a new generation of young farmers.